I came across this fantastically modern ad in the April 1945 issue of Radio-Craft magazine and just had to share it with you as we all slowly slide into the summer. The ad was for Detrola, a company based in Detroit, Michigan that made some absolutely gorgeous radio sets in the 1930s and 40s. Of course, the United States was still mired in World War II when this ad ran, so the company encouraged people to “keep on buying and keep those war bonds.” But the theme that things will be better in the future should be familiar to any regular readers. 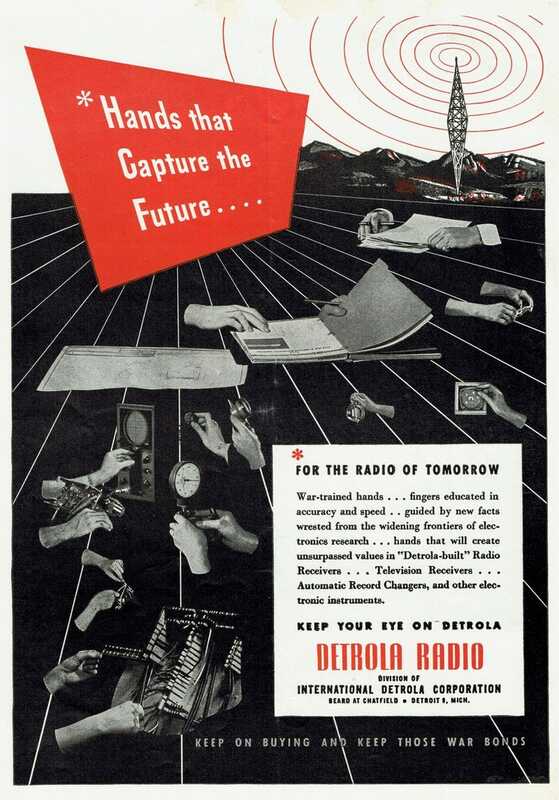 You’ll notice that among the promises this ad makes for the future are improved radio receiver, automatic record changers, and the big deal innovation of tomorrow: television.